You may have read my behind the scenes maternity blog I wrote back in February, featuring my sister. I had the pleasure of photographing her baby recently, so thought I’d give you another behind the scenes look, this time featuring a gorgeous newborn baby girl. As usual, I set up the studio with the appropriate lights, props etc. Since this is a newborn shoot, it requires a lot of additional preparation to ensure the safety and comfort of the baby. 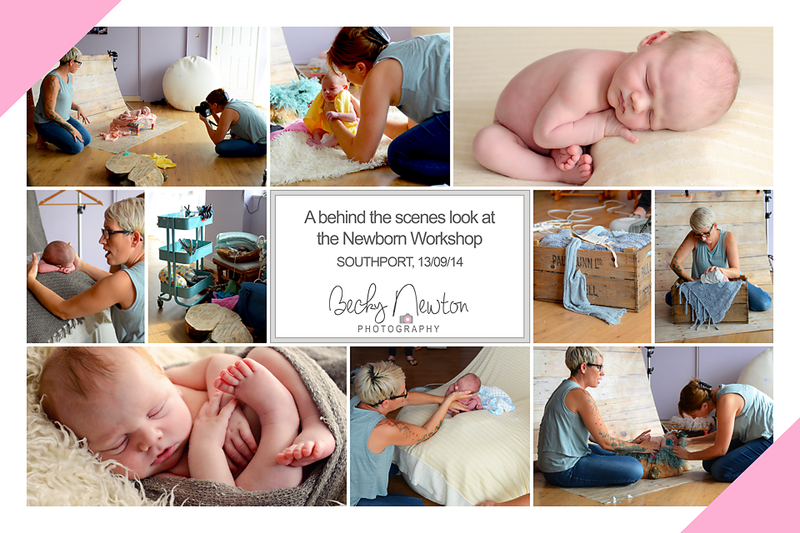 You can find more detailed information on the safety side of the setup on my blog ‘Newborn Photographer Safety‘. Once the studio is at the required temperature and all safety precautions had been met, it is time for the session to begin. Once the baby has been fed, changed and settled I will start to position them. Notice my phone in the video – I normally have white noise playing throughout the session as it helps to settle the baby. I will go through various poses using different blankets, headbands etc, then move onto props and family photos depending on the clients’ preferences. Safety is paramount at all times – making sure baby is posed safely with no risk, warm enough, hands/feet not losing circulation from the poses. The session will normally take 2-3 hours which allows plenty of time for feeding and settling the baby. Once it is over, I then begin the process of selecting and editing the very best images for my clients. Here’s a look at what goes on! Normally when choosing a photographer you may look at the images they have taken, how near they are to you, and the session cost. That works well for most types of photo shoot, but there are additional things you should be aware of when choosing a photographer for your newborn baby. First and foremost is – how safe are they? I just wanted to write this post to give some general advice, and to reassure any of you reading this who are thinking of booking me for a newborn photo shoot. Safety in a session is my highest priority. Here’s a list of things to be aware of during the photo shoot. Room temperature – the room should have a small heater and preferably a thermometer, to ensure a comfortable temperature for your baby (although it can feel slightly too warm to an adult remember that baby can get cold easily, and will be either naked or covered in a thin wrap/blanket). I constantly check babies by feeling either their stomach or neck to see if they are warm enough/too warm – remember that hands and feet aren’t always a good place to check as they can feel cold regardless. Tipping risks – if a baby is posed in a basket or box, for example, there is a risk that the container could tip over with the baby’s weight. There are two things that need to be done to counteract this risk – an adult/myself needs to stay very close at all times, just in case, and the container should be weighed down, which will make everything much safer. I use my husband’s dumbbell weights in the bottom of my containers! Baby’s circulation and comfort – for some poses, the baby may be resting on their hands, or have their hands/feet tucked under them. It is important to regularly check their circulation, to make sure that they are comfortable and haven’t started losing circulation in these places. Another point to note is when the baby is resting on the edge of a container there should always be some kind of padding underneath them e.g. a blanket, as the edges of containers will not only be uncomfortable, they could potentially be dangerous if there are rough edges etc. Composites and editing – firstly, in case you are not aware, a composite is where two or more images are merged together in a photo editing program to make one image. This is used by a lot of newborn photographers to create an image which would not be possible to do naturally without a big safety risk, and particularly applies to images you may have seen where it looks like the baby is supporting their own head with their hands. Photo editing programs can be used to create images that look natural, but aren’t. 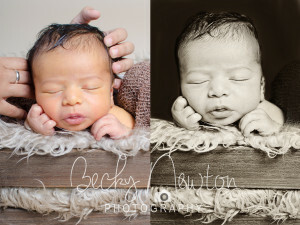 Using the below pose as an example, you can see that the baby’s head is being supported at all times, and then the parent’s hands are edited out afterwards and the background converted to black to make the image appear more natural. I only ever attempt a composite pose (or pose such as the one above that needs heavy editing) in the following circumstances – the baby is in a deep sleep, I feel that the baby can be held safely at all times, and that the pose will not be uncomfortable for the baby (some babies get very uncomfortable in certain positions and if I sense they are not happy, I will not continue to try to get the pose and will instead move on to something else). Finally, it is worth looking out for photographers who are members of BANPAS (the Baby and Newborn Photography Association), as they should adhere to the BANPAS code of conduct which promotes safe working practice with newborns. You can find out more about the association here. Hopefully those few tips will help you to be more aware when you are choosing a newborn photographer for your baby. If you have any questions or comments please feel free to get in touch via my contact page!